We considered clinical observations in patients with obsessive-compulsive and anxiety disorders who underwent bilateral anterior capsulotomy, as well as anatomical and pathophysiological findings. Based on these considerations, we chose the shell region of the right nucleus accumbens as the target for deep-brain stimulation in a pilot series of four patients with severe obsessive-compulsive and anxiety disorders. Significant reduction in severity of symptoms has been achieved in three of the four patients treated. 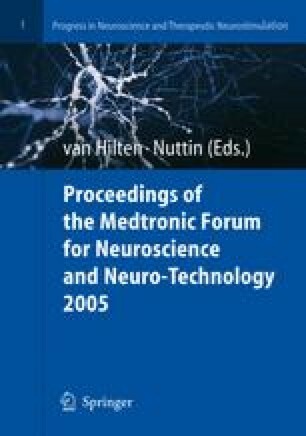 Clinical results, as well as a 15O-H2O-PET study performed in one patient during stimulation, speak in favor of the following hypothesis: As a central relay structure between the amygdala, basal ganglia, mesolimbic dopaminergic areas, mediodorsal thalamus, and prefrontal cortex, the nucleus accumbens seems to play a modulatory role in the flow of information from the amygdaloid complex to the latter areas. If disturbed, an imbalanced information flow from the amygdaloid complex can yield obsessive-compulsive and anxiety disorders. These can be counteracted by blocking the information flow within the shell region of the nucleus accumbens by means of deep-brain stimulation (DBS).